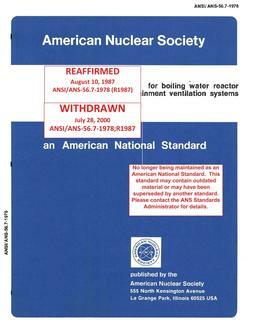 The purpose of this standard is to establish minimum requirements for design, installation, testing and maintenance for ventilation systems serving the containment of boiling water reactors (BWRs). 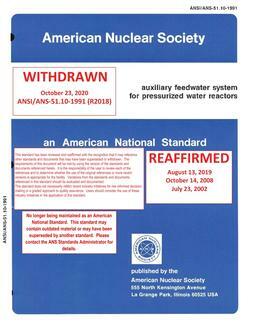 For purposes of this standard, containment is construed to include all structures with the following functions: (1) Capable of withstanding the initial peak and long-term pressure and temperature resulting from a design basis event (2) Providing a primary, essentially leak-tight barrier (primary reactor containment) against fission products released from the reactor coolant pressure boundary as a result of a DBE (3) Providing a secondary containment against release of those fission products to the environment. The systems included are those that supply, recirculate and exhaust air, and provide air treatment when necessary to ensure the health and safety of operating personnel and of the general public during normal operation and during DBE conditions. Treatment systems may be shared with other structures of the plant. 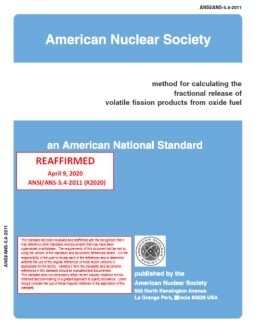 This standard does not include either (1) pressure suppression systems for the automatic attenuation of the pressure surge resulting from a break in the reactor coolant pressure boundary, or (2) combustible gas control systems (such as recombiners) for reducing overall buildup of combustible gases in the containment atmosphere following DBE. The standard does not specify the types of containment ventilation systems to be used in BWRs.